The Full Throttle Fall Weekend is back by popular demand, featuring two days of heart-pounding short track racing. The NASCAR Whelen Modified Tour will take center stage racing in the longest mileage and richest purse race on the Tour, the Musket 250 presented by Whelen on Saturday, September 21 at 3:30 p.m. 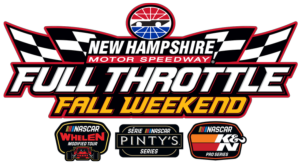 The tripleheader Saturday also features the NASCAR K&N Pro Series East racing in the Apple Barrel 125 at 1:45 p.m. and the NASCAR Pinty’s Series getting the on-track action started with the Visit New Hampshire 100 at 12:15 p.m.
Includes one camping spot in Trackside Terrace & two armbands. Includes two grandstand tickets for Friday & Saturday, one camping pass & one tow vehicle sticker. Includes one camping spot in Turn 3 & two armbands. Includes one camping spot in Lot N4, two armbands & two pit passes. Includes one 20'x40' camping spot in Lot S9. Includes one 20'x30' camping spot in Lot S9.